It was something I’d never done before . 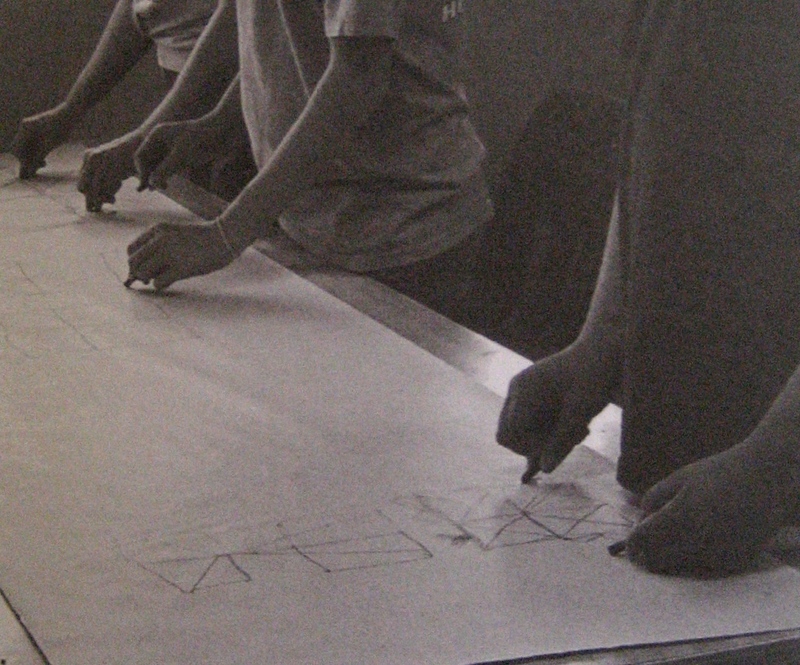 . . holding chalk in each hand to make a variety of shapes. 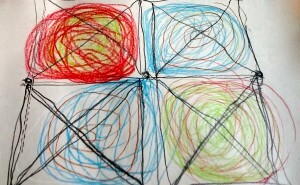 We followed dot-to-dot patterns, drawing both up and down, toward and away from the midline. 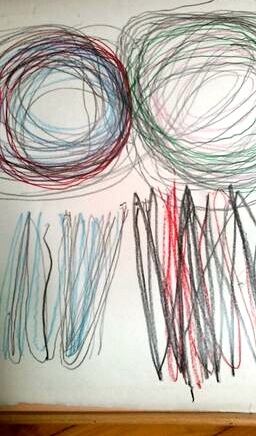 It was the early 1970s and I was attending an in-service taught by a developmental optometrist* who explained that this “bilateral drawing” technique was used to help learners orient themselves spatially and improve eye teaming. Major improvements in math, reading, and cognitive abilities were said to follow. 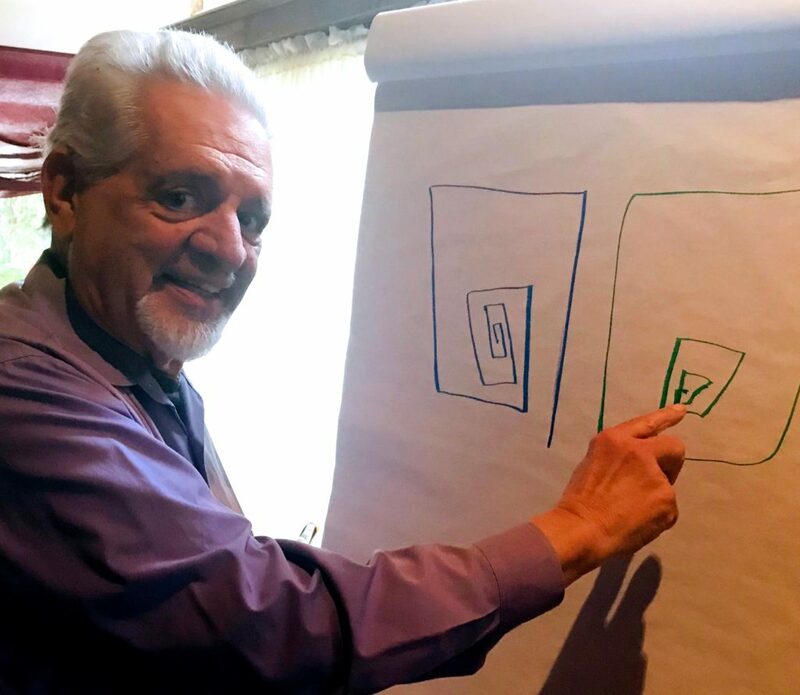 Paul Dennison, Ph.D., shows how his non-dominant hand has mirrored the movement of his dominant in a simple Double Doodle. I immediately added bilateral hand motions to the private reading sessions I offered at my eight Valley Remedial Learning Centers. 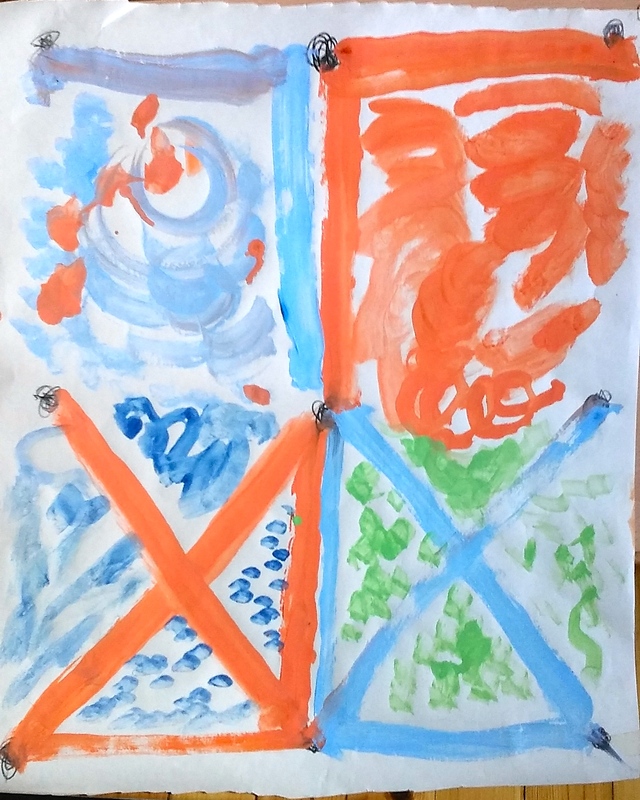 Time and again, I saw students shift from the effort of one-handed drawing to smooth ambidexterity after doing a minute or so of bilateral drawing. One student in particular comes to mind. Jose, age 8, would do cursive loops** with his left hand up to the middle of the page, then switch the pencil to his right hand to continue. His parents told me that he was not good at sports and was clumsy at home, always dropping things. Jose was demonstrating a lack of centralized kinesthetic awareness. I noticed that after practicing the reciprocal hand motions, Jose’s hands became more lively and coordinated. He soon began to draw by leading with the right hand and following with the left, “mirror-image style.” After continuing to guide Jose in bilateral drawing for six weekly sessions, I was excited to see Jose now writing with the right hand only, easily crossing the midline of the page without changing hands. 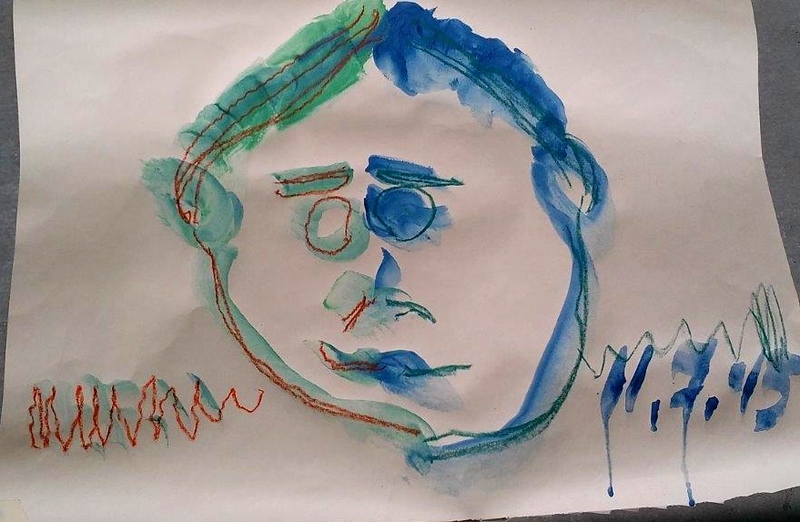 Now, when I had Jose visually track a moving object, his eyes no longer quivered or jumped while crossing the midline; his eye-hand coordination was clearly becoming more skilled and adept. Around the same time, he began reading with greater ease and comprehension, and his father told me that they were now able to play catch together. *Dr. Sowby, a developmental optometrist and close friend, had studied with Dr. G.N. 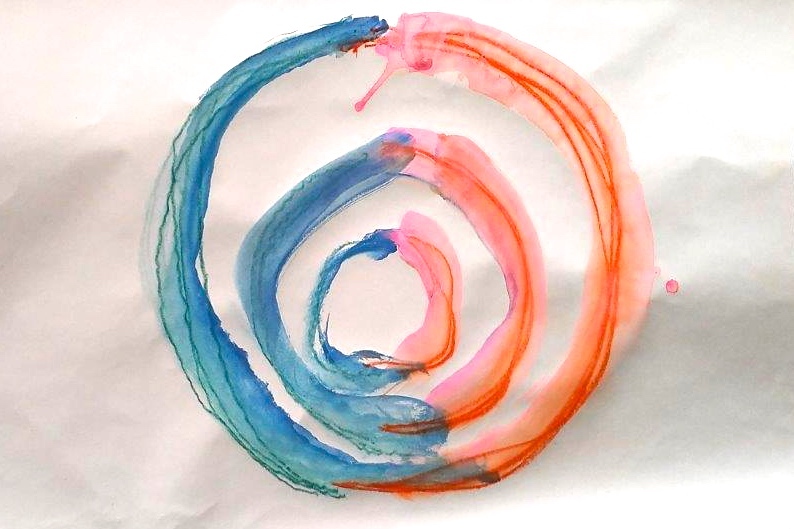 Getman, the developmental optometrist who had discovered “bilateral drawing” and wrote about it in his classic How to Develop Your Child’s Intelligence. Getman’s bilateral drawing was accomplished dot-to-dot style. 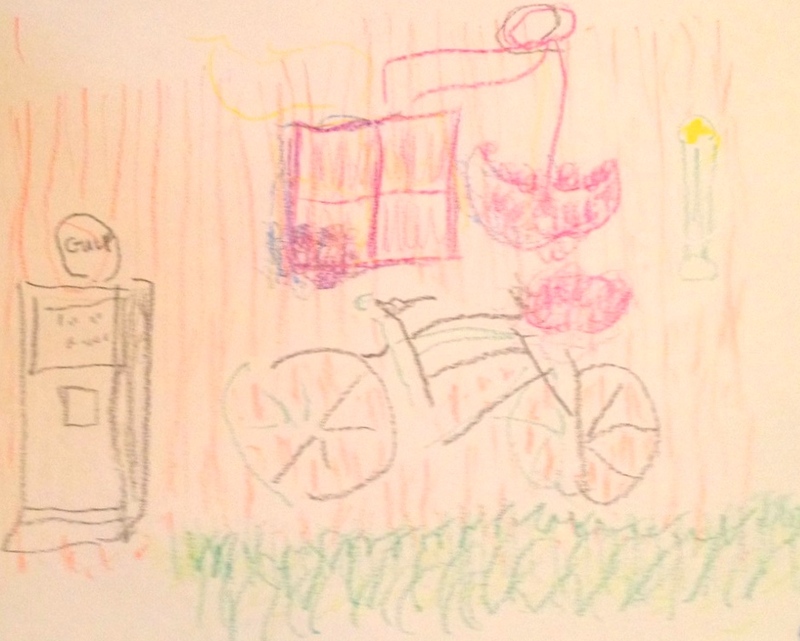 It was during Gail’s innovation, as we developed the Brain Gym activities, that this gave way to free-form drawings. **At the time, I had all my students do a line of cursive loops (from the Palmer Method) before writing. Learn more about the Double Doodle and other Brain Gym activities in Brain Gym®: Teacher’s Edition, by Paul and Gail Dennison, ©2010, Edu-Kinesthetics, Inc., Ventura, CA. 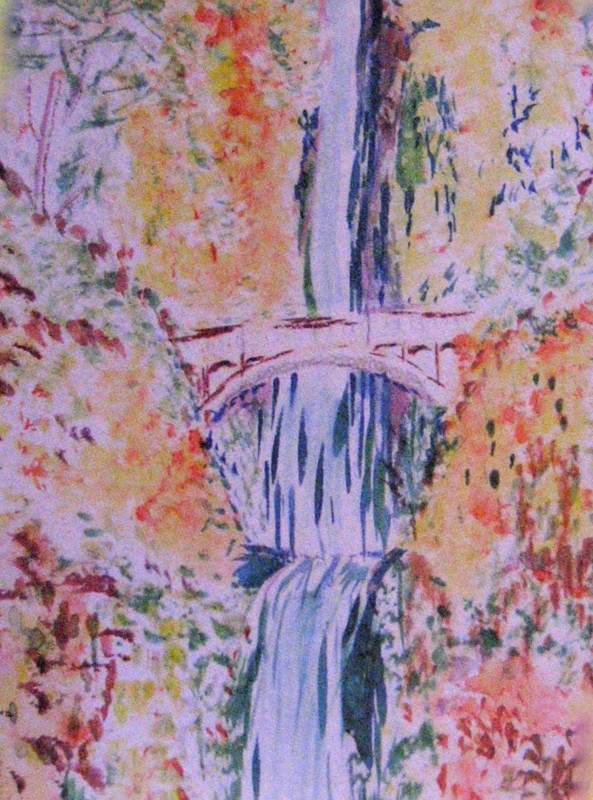 © 2019 by Paul E. Dennison. All rights reserved. Brain Gym first came to my attention in 1984 when the younger of my two boys was having difficulty learning in the traditional school system. He was just age nine when he began to do the activities, and the changes in his attitude and his physical skills when reading and writing soon boosted his confidence. I became interested in the idea that movement is important in helping people learn, and began taking Brain Gym courses and even teaching. 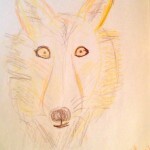 By the time my son was aged 13, he enrolled himself in a speed-reading course. He has continued making self-directed choices about his ongoing education. In 2003 I attended my first workshop in Double Doodle Play: A Window to Whole-Brain Vision*, and in 2007 completed my training to become a Teacher Trainer. I have been facilitating this amazing course worldwide since 2007, having now taught more than 30 courses. 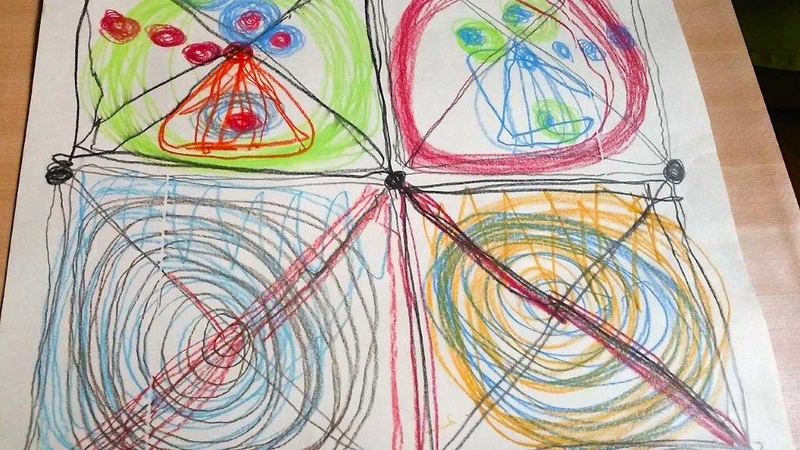 The Double Doodle Play workshop is built around play and games that engage both hands in drawing and tracing images, tactilely and kinesthetically, in the center of vision. 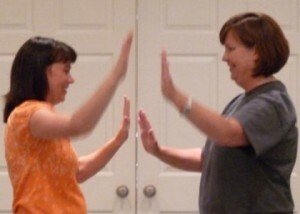 The continuous up- down- in- and out- motions relax the eyes and enhance visual skills by supporting hand-eye coordination and sustained eye teaming in the visual midfield. In 2009 I met Rod Dennis, the founder of the Rodney Aphasia Group, Inc.**, and he invited me to be guest speaker at one of their monthly meetings. 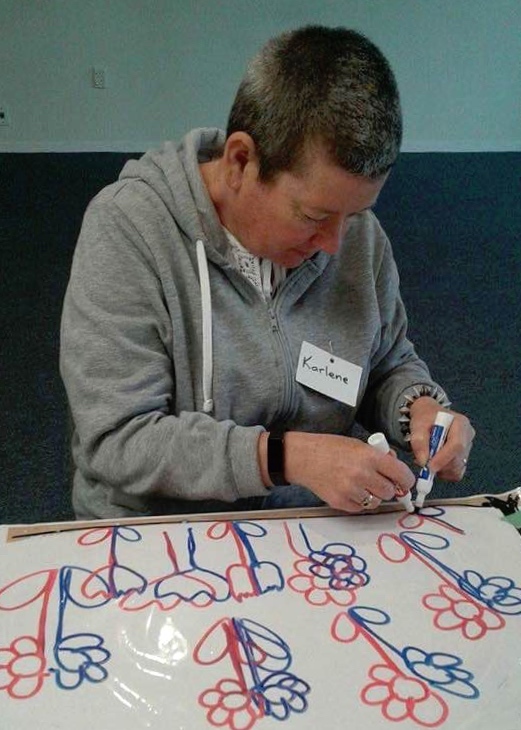 Every year since 2010 I’ve given a Double Doodle Play workshop for the Rodney Aphasia Group, modifying the course especially for people who have been left with aphasia following a stroke. Aphasia literally means “absence of speech.” Aphasia is the term used to describe the loss of a previous ability to express or understand spoken or written language, due to disease or injury to the language area of the brain. In New Zealand, strokes are the major cause of aphasia, and head injury is the 2nd most common cause. The members may attend as many times as they like, and usually do so for a couple of years in a row. New members are always joining. 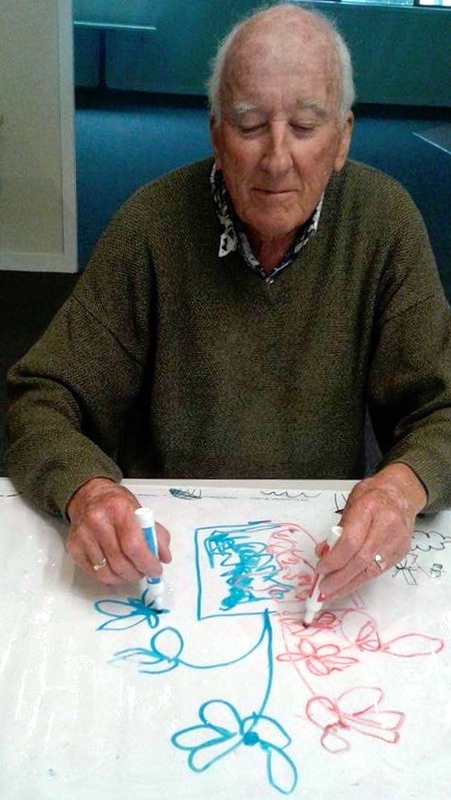 I have now taught Double Doodle Play to more than 50 aphasia students in the last seven years. 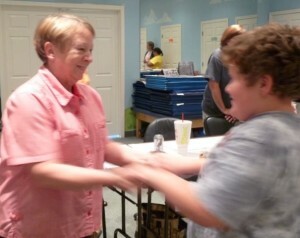 I also attend the group’s monthly meetings, when able, to encourage them in using the Brain Gym activities. Since many members of my aphasia group experience fatigue when concentrating, I usually offer the course in two half-day sessions, scheduled a week apart. 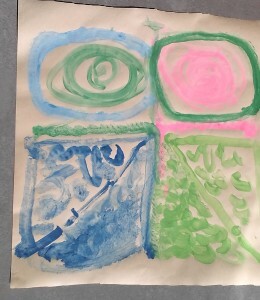 I find that, in today’s busy world, one key to helping learners of any ability to become more attentive to their needs and gifts is to teach them the four Brain Gym activities that make up PACE. Often, learners are simply overthinking, moving too fast, or trying too hard to notice what’s actually happening with their physiology. So in that first session, I spend a lot of time teaching PACE—an acronym for Positive, Active, Clear, and Energetic, and for four basic Brain Gym activities that support hydration, near-far range of visual motion, bilateral coordination, and balance. 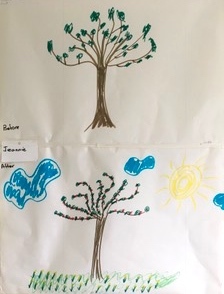 For each of the four activities, we do considerable “before and after” noticing*, to enhance student’s mindful awareness of their visual/sensory processes. 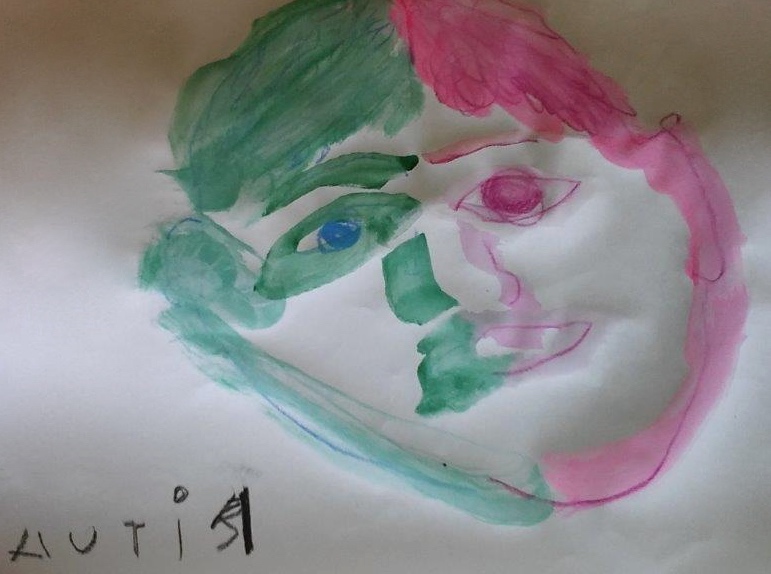 For this article, six of my students from the aphasia group have given permission for me to share their photos, their before and after drawings from this year, and a little about them. 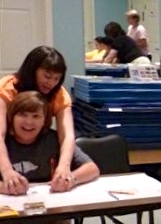 Ruth, our group chair, explores use of both hands together on the midline. 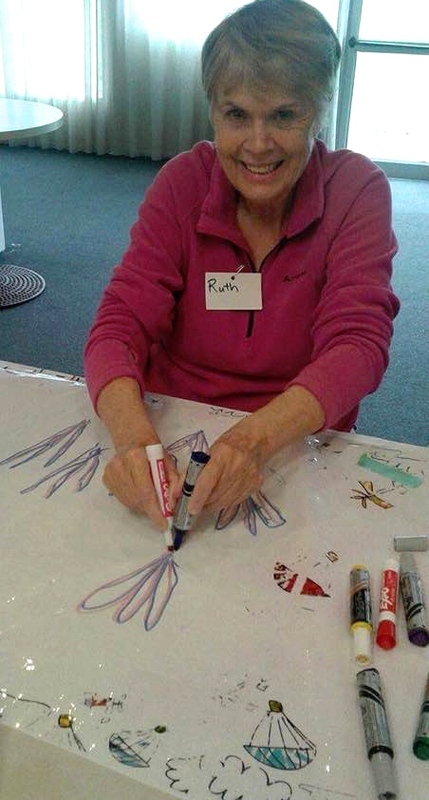 Ruth, attending for the first time this year, says that doing Brain Buttons (one of the four PACE activities) helps her to slow down her thoughts. She finds that after doing the Brain Buttons she can speak in whole sentences, as long as she speaks slowly. She also uses the activity when chairing the meetings, to help her when searching for sentence structure. My students often tell me that doing the PACE activities gives them sensory cues to help them slow down, notice what they’re thinking and feeling, and connect with the natural rhythms and ranges of eye and body movement. 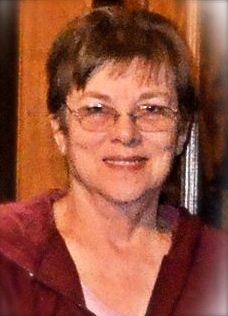 Des has been attending the group since 2010. 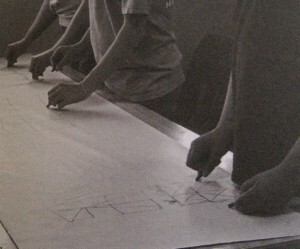 Often, a student’s partner will attend the workshop with them. 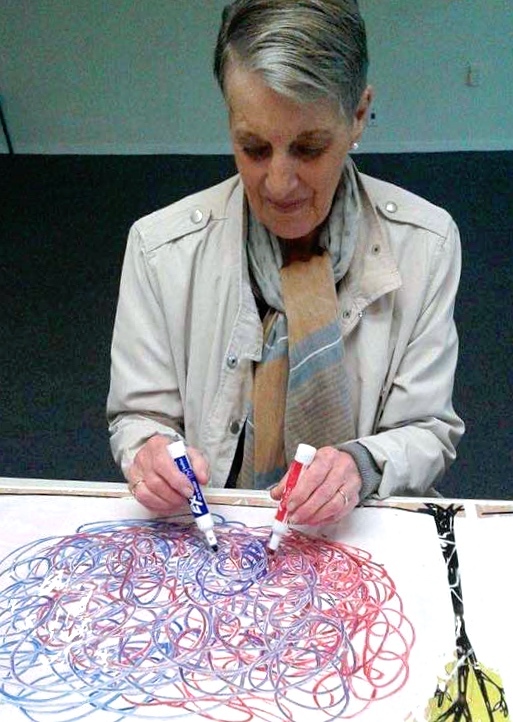 Sometimes partners find it even more challenging to do the Double Doodle Play activities than those who have had a stroke. For the first two years after his wife had a stroke, Des came to the meetings together with her. 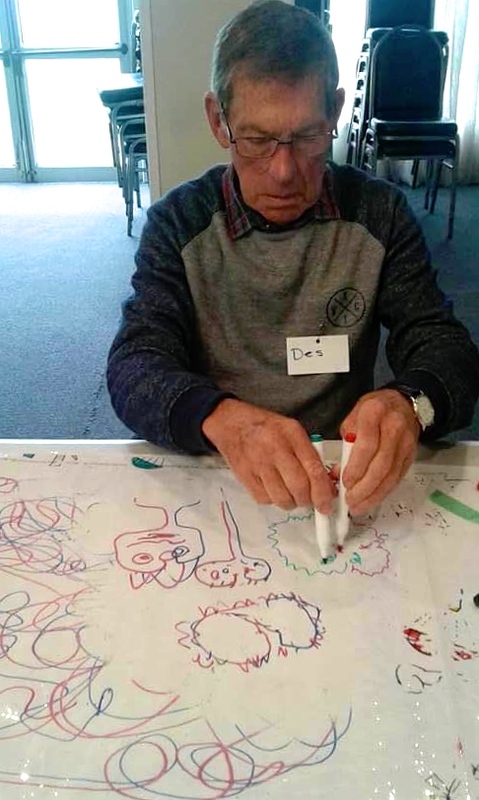 After she died in 2012 from yet another stroke, Des has continued to attend, saying that he greatly enjoys the playful experience. He appreciates the yearly up-date and learns something new every time. 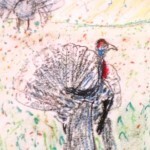 This time, he says, he learned how important it is to do PACE slowly and mindfully. The experience of aphasia is different for each person. Many of the students I teach experience mild to severe difficulties finding words, reading text, or understanding what other people are saying. Some also have the physical signs of stroke with restricted movement on the right side of their body. 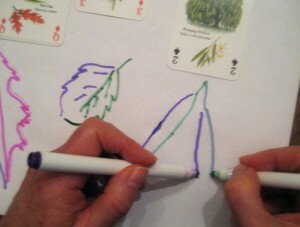 Karlene discovers the ease of Double Doodling as she orients each flower to her midline. Karlene is new to the group. She finds that she gets easily frustrated. She often has tears as she speaks and, although she voices strong feelings, she sometimes has difficulty remembering. She says that, through doing the course, she has learnt to listen, and has much more confidence. 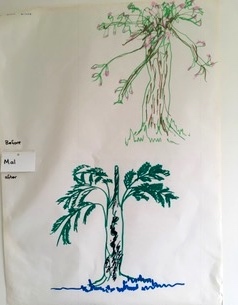 She speaks of using the power of PACE in all her therapies (those that she is enrolled in as part of the Aphasia Group continuing support programme). Jeannie, Karlene’s mum, also attended the course for the first time. Janelle has struggled to help Karlene, and is grateful for the positive change in Karlene in just the one week. 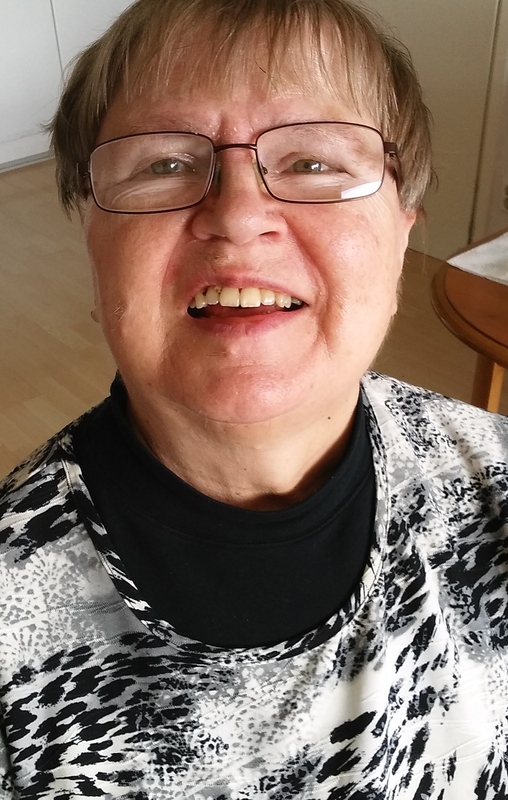 Other members of the group at our most recent meeting expressed to me the changes they see in Karlene, as well, noting that she has become more centered and better prepared to interact socially with friends playing darts. Jeannie, Karlene’s mum, is there for her daughter. When teaching, I use basic principles from Brain Gym 101: Namely, Noticing and the Dynamic Brain Model. ** I explain briefly the anatomy of the brain and its corresponding sensory and motor pathways. 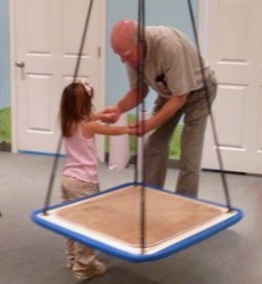 I find this imagery helps to facilitate an experiential process of Dennison Laterality Repatterning*** with the whole group (usually done while sitting down, as balance is a concern). I keep the information simple, with diagrams to support their understanding. I speak slowly, monitoring each student’s ability to stay with me. I follow this activity with either a Deepening Attitude Balance and /or a F.A.S.T. 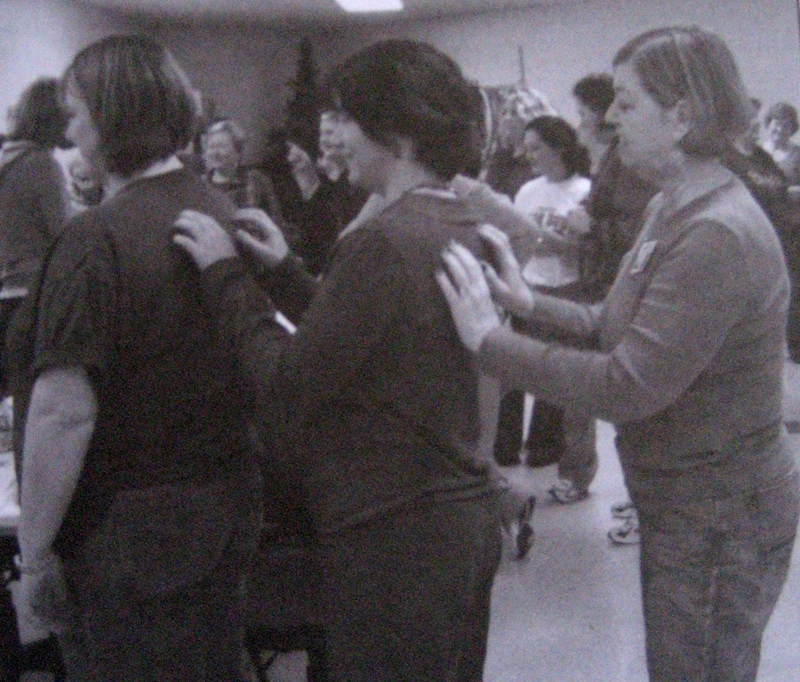 Action Balance, focused around each person’s sensory memory of the stroke experience. Through the years, many students have particularly shared with me that doing these two balances have provided a turning point in their ability to move forward. Mal attends with his wife, Leoni. Mal attends the courses and monthly meetings with his wife, Leonie. He says that he has learnt a lot about accepting that life has changed, now that his wife has had a stroke. He has done a lot of research on different methodologies to assist Leonie. The second week, in session two, we explore the Double Doodle Play process in greater depth, using five simple hand movements. 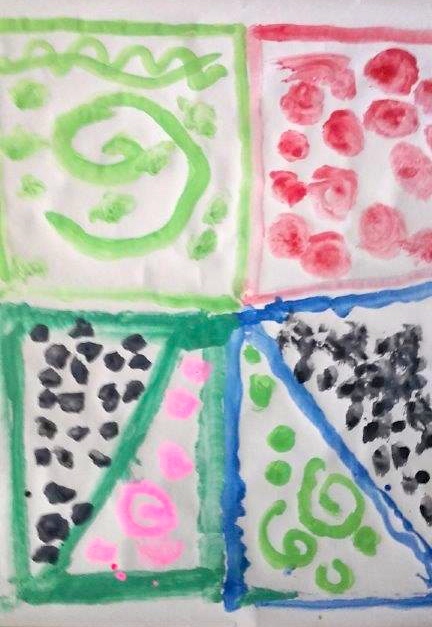 We play with scarves in the air, Double Doodling the various shapes to music by Mozart. I am also lucky enough to have rolls of whiteboard-like material that we can use with whiteboard pens, which we erase and reuse. 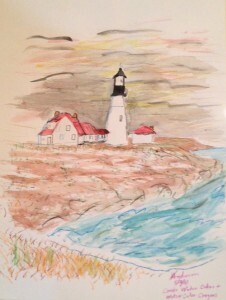 The before and after work shown here was done with markers on paper. Most of these participants have now recovered from their strokes to the point where they show no visible signs of it until they attempt to speak. 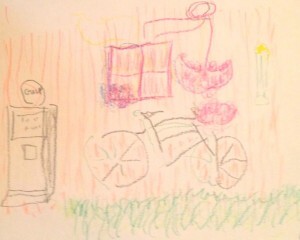 Leoni is learning to write and draw with her left hand. 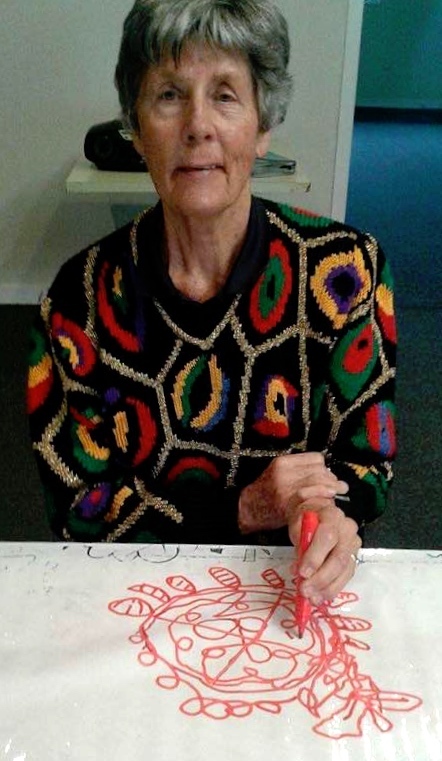 Leonie, a talented writer and lifelong right-hander, has been unable to “un-claw” her right hand since the stroke. She can do large motor movement with her right arm; however, she doesn’t yet have fine-motor control with her right hand. So Leonie is exploring how to write with her left hand and has gained more confidence in her penmanship since taking the course. So far, she still struggles to do the Cross Crawl. 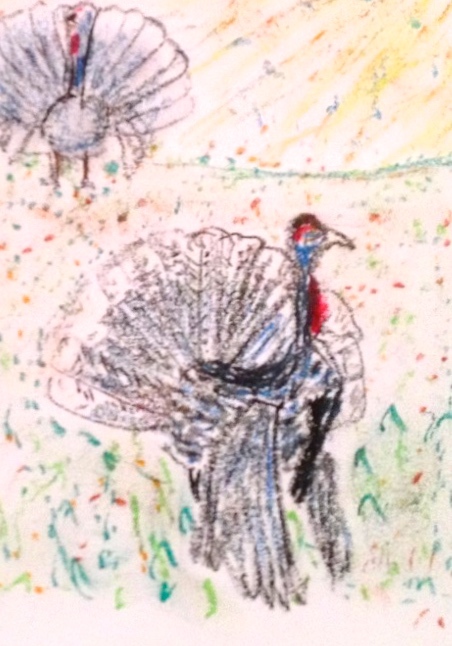 She is fiercely independent, now walking with a stick. Leonie is verbally challenged and looks to Mal to speak for her. At the beginning of the class Leonie only spoke in single words. By the end of the two sessions, she was able to speak a full sentence with confidence, sharing about how much she enjoyed the class. Leoni’s before & after drawings. ***Double Doodle and other Brain Gym activities are described in Brain Gym®: Teacher’s Edition, by Paul and Gail Dennison, ©2010, Edu-Kinesthetics, Inc., Ventura, CA. **Rodney Aphasia Group, Inc., is in Orewa, New Zealand. “Before and after” noticing is described in Brain Gym 101: Balance for Daily Living Manual, (pages 59, 62 64). 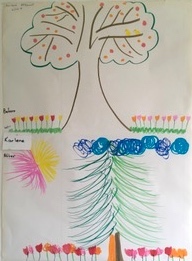 **Brain Gym courses are based on the balance process: Five Steps to Easy Learning. Dennison Laterality Repatterning and other balances mentioned here are taught in Brain Gym 101: Balance for Daily Life. 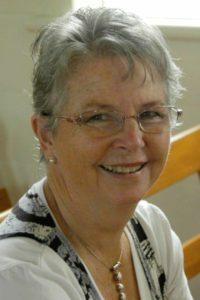 Glenys Leadbeater, Orewa, New Zealand, is a registered nurse with a post graduate diploma in Operating Theatre Techniques. 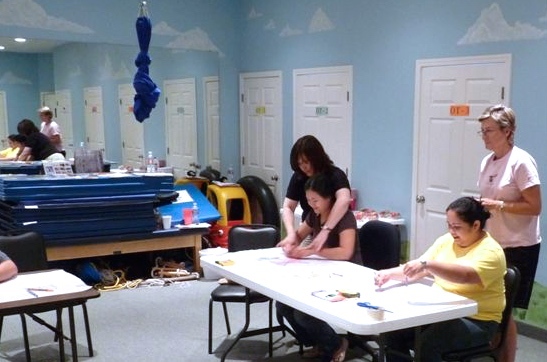 A Brain Gym International Faculty member since, 1992, Glenys has done extensive training since 1985 with the founders of Educational Kinesiology, Dr. Paul and Gail Dennison. Glenys is one of the founders of Edu-K in New Zealand, and sits on the Board there. Brain Gym International recognized her in 2001 with the Outstanding Achievement Award for her contributions to Educational Kinesiology. She has worked tirelessly in promoting Edu-K to people from all areas of life, and traveled extensively, teaching in over 14 countries, as well as sponsoring many international Brain Gym instructors and courses in New Zealand. Glenys has been teaching for over 35 years. 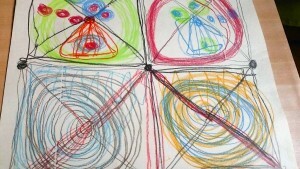 Besides Double Doodle Play: A Window to Whole-Brain Vision, Glenys also teaches Brain Gym 101: Balance for Daily Life, Optimal Brain Organization, Visioncircles, and the following advanced courses—Edu-K In Depth: Seven Dimensions of Intelligence, Creative Vision, Total Core Repatterning, Movement Re-Education, Brain Gym Teacher Practicum, Optimal Brain Organization Teacher Training, Double Doodle Play: A Window to Whole-Brain Vision Teacher’s Training, Visioncircles Teacher Training. Glenys is a keen gardener and homemaker. 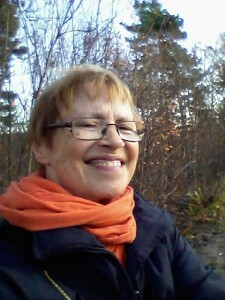 She enjoys playing tennis, cycling and beach-walking, knitting and crochet. She also shares the interests and successes of her husband Roger, her two sons, Brendon and Gareth, daughter-in-law Marie, and grandsons Matthew and Joshua. © 2017 by Glenys Leadbeater. All rights reserved. Click here to read a translation of this article into Italian. 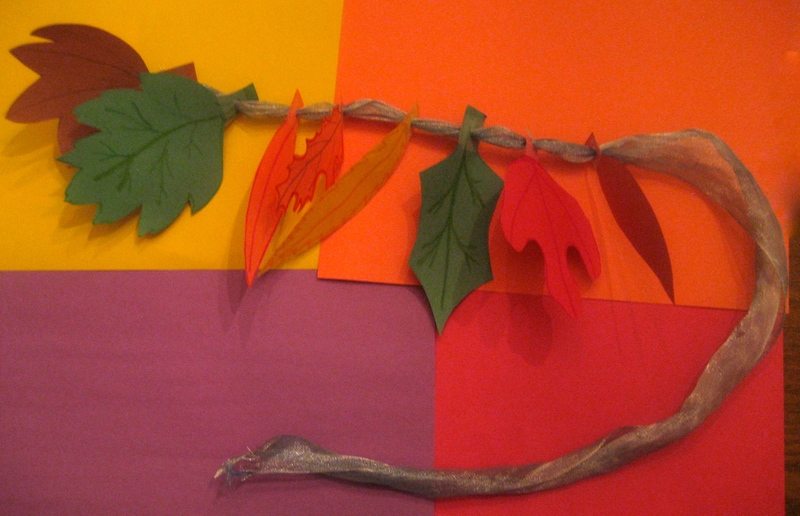 Homemade leaves, strung on a pretty ribbon, make a decorative fall banner and a joyful way to learn about leaves and trees. My 12-year old granddaughter and I recently made this simple banner of fall leaves to decorate the chandelier above the family table. She came to me with the idea. 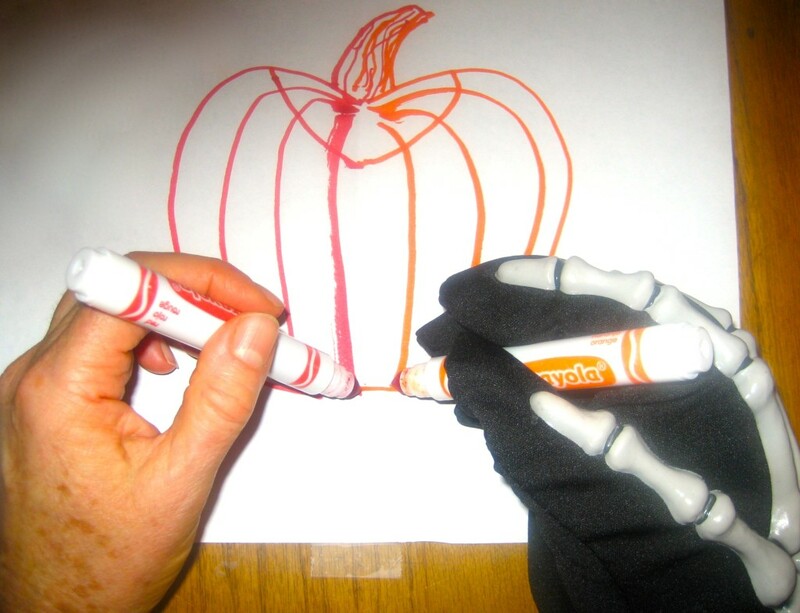 This is a fun and simple project for ages 8 and up. 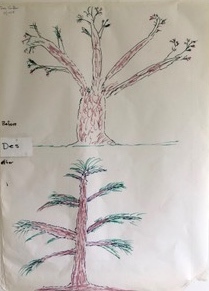 Start to finish, it took us 40 minutes, including the time we leisurely discussed different types of trees and their leaf formations. Actual drawing time was about 5 minutes. Cutting took the longest. 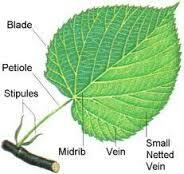 Select one or more types of leaf to draw. 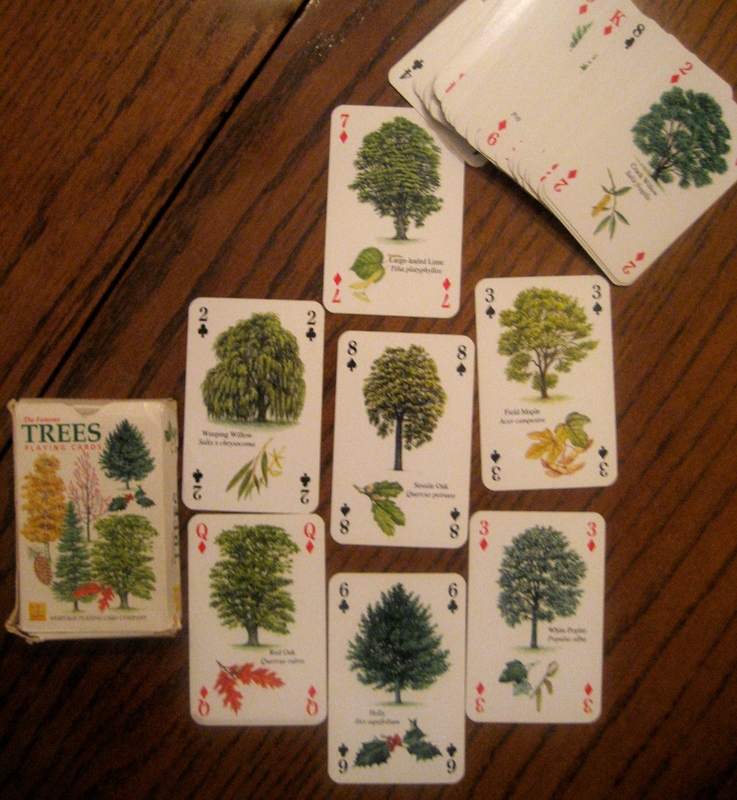 We got our ideas from the illustrations on the Heritage playing cards,* as this gave us a chance to look at the beautiful variations of leaves from different trees, as well as the overall tree shapes. 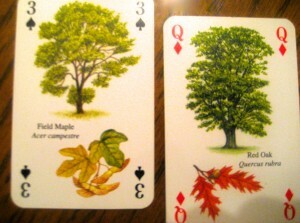 A glimpse of a few of the tree and leaf varieties that we discussed and chose from. We especially liked the shapes of the leaves on the field maple and red oak, shown here. 2. 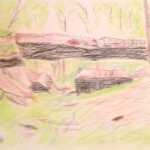 Do a few quick sketches and select the ones you like best for copying. 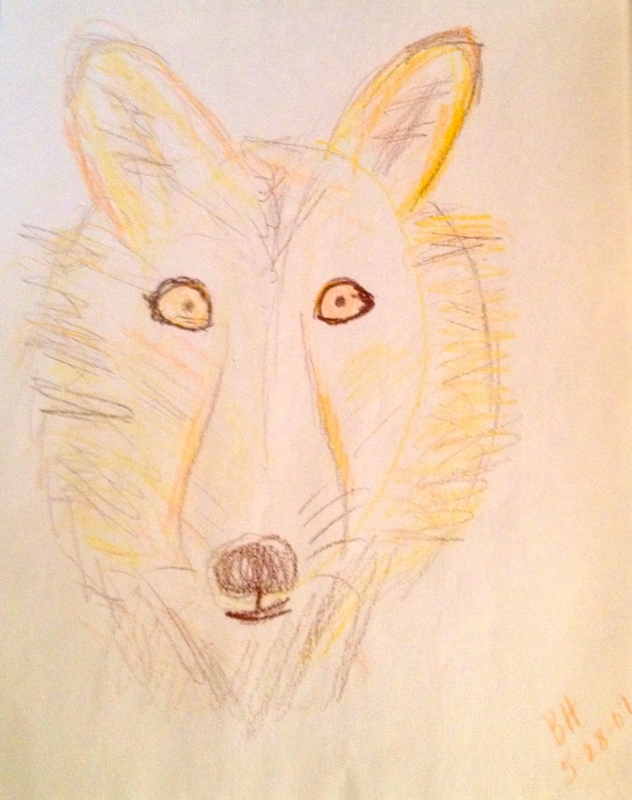 A 12-year old’s quick Double-Doodle sketches. 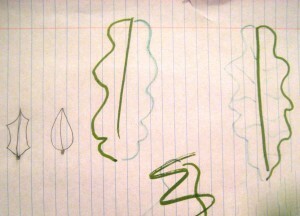 My quick Double Doodling of willow leaves. It’s fun to use 2 colors; though not essential. 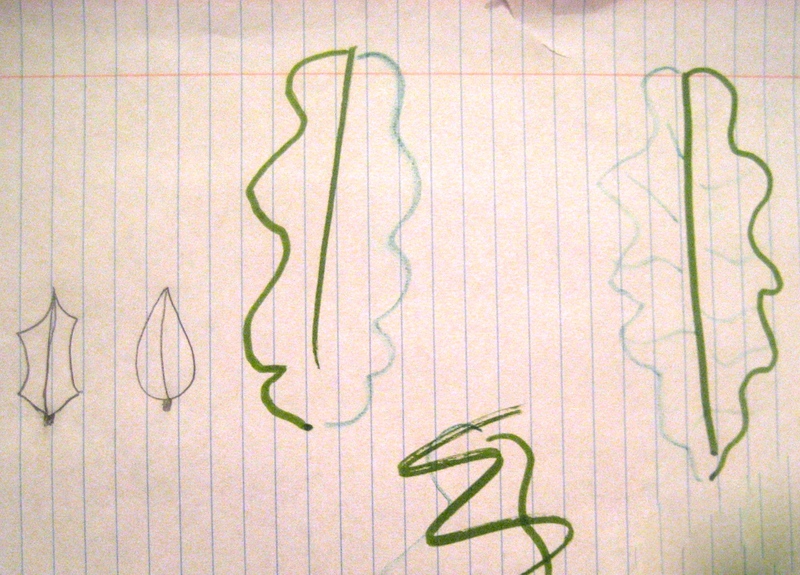 Notice how drawing different parts of your leaf can invite you to make different hand motions. 5. 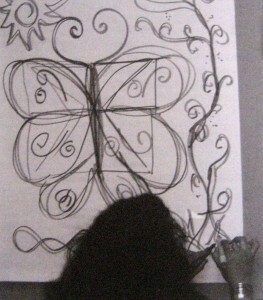 Draw the outside contour of your leaf. 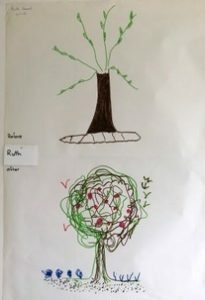 Many leaf shapes are easiest to draw if you turn the leaf so that it’s tip is facing you, and begin by drawing the petiole, the part that attaches to the branch. This way, your hands can move easily toward you in a flowing motion, gliding slightly in and out as you follow any interesting contours of the leaf blade. 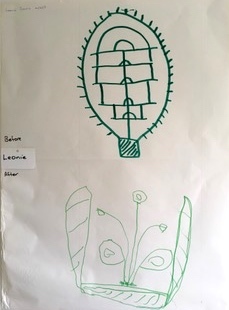 You’ll see in the photo at left that my granddaughter experimented with drawing the leaves both ways; beginning from the tip (far left) and from the petioles (larger drawings at right). In some cases, we used our leaf templates as a jumping off point to create our own imaginative shapes. Leaves are not usually perfectly symmetrical, and yours will probably not be. Imperfections make them more interesting and natural looking. 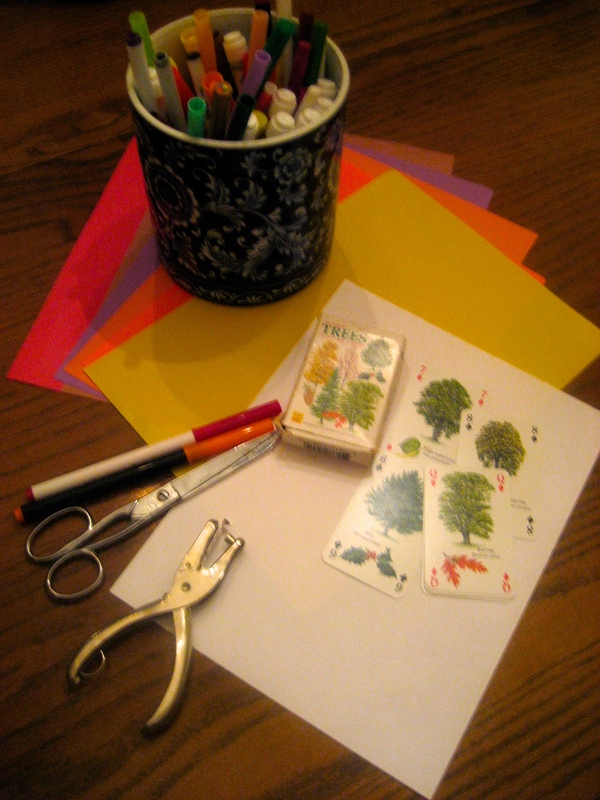 Note: We made the petioles quite wide to accommodate the hole punch. Some completed Double Doodle leaves. 6. You can draw the leaf’s midrib (it’s midline) with one hand, or else, if you wish to keep going with the kinesthetic feeling of the Double Doodle, place your non-dominant hand on top of your dominant one as you draw this downward stroke. I find it easiest to do the veins and small netted veins at the leaf sides with both hands at once, flowing directionally down and out from my midline. 7. 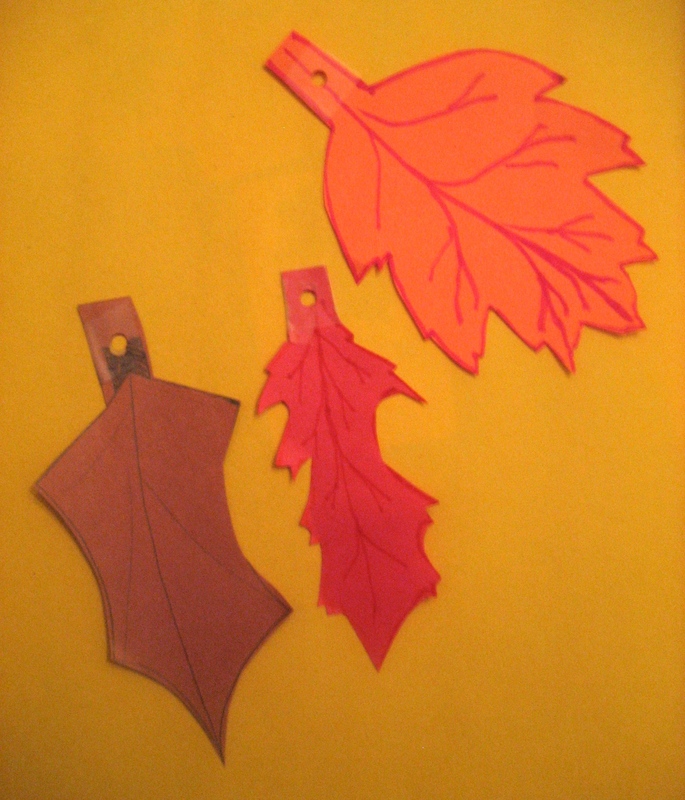 Cut out the leaf shapes. 8. Use your hole punch to make a hole in the bottom of each leaf (see photo, right). 9. Thread the leaves onto an interesting ribbon and then string it on a mantle, in front of a window, or wherever you like. 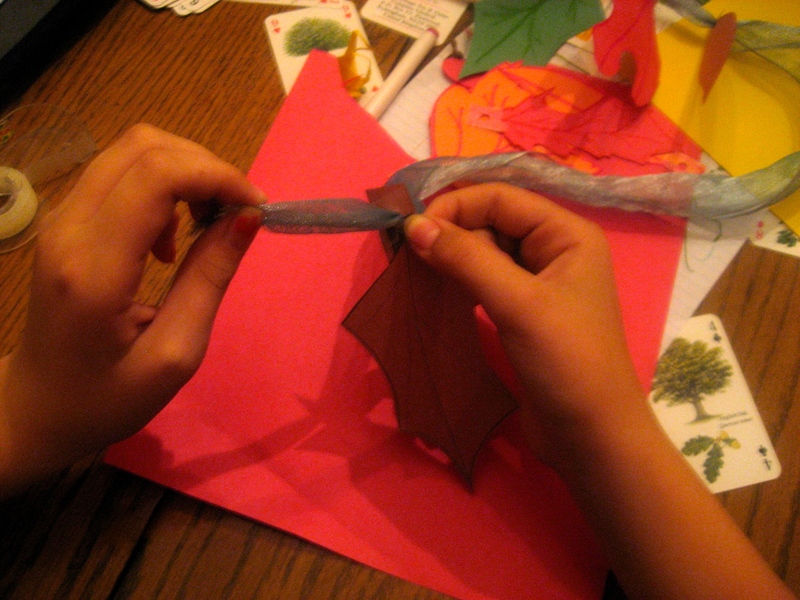 My granddaughter threads the leaves onto a silver ribbon she found in the gift recycle. 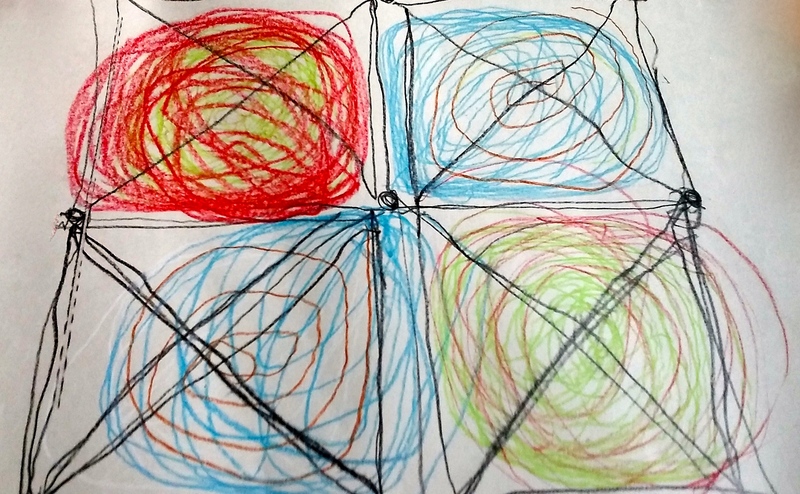 *Since I often travel to teach the course Double Doodle Play: A Window to Whole-Brain Learning, I like to have small artistic templates to inspire my students. 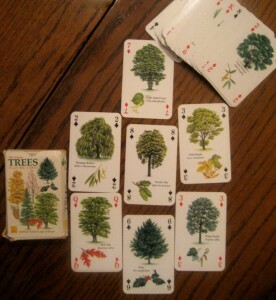 The Heritage Playing cards offer a wide range of beautifully illustrated cards. For our banner, we used their “Famous Trees,” on Amazon here. Heritage cards also offers a host of other options, including such favorites as Backyard Birds, Ocean Animals, and African Animals. 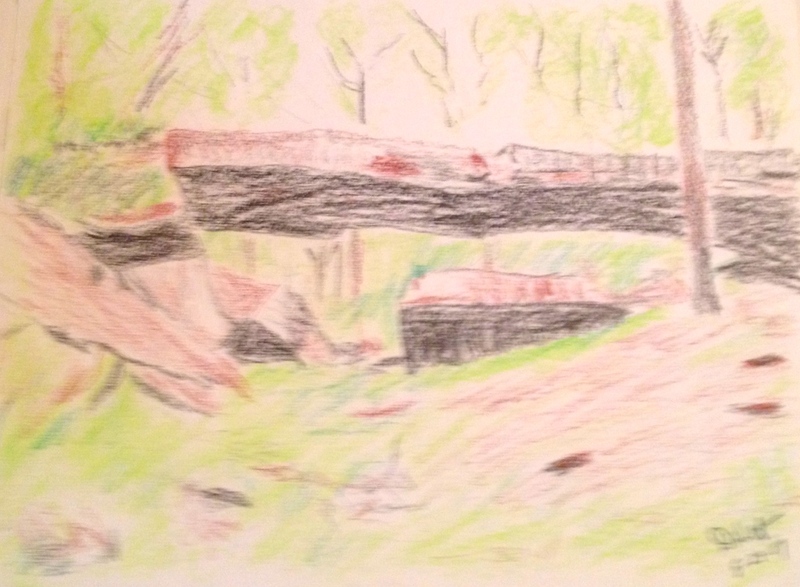 © 2015 Gail Dennison. All rights reserved.